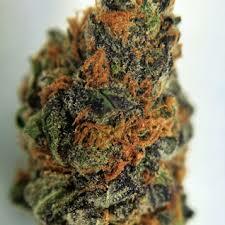 Purple Kush is one of those rare strains which are purely indica. This is apparent from the vivid colors of its flowers and its potent taste, which sets it apart from the other hybrid strains. 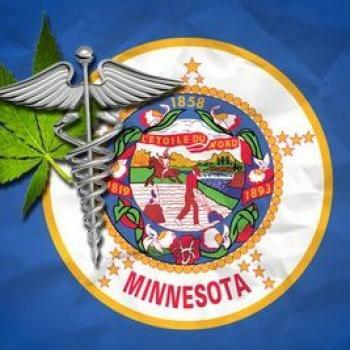 It was created by a group of breeders in Oakland, California which is famous for being one of the first areas in the US to legalize medicinal marijuana. The strain is the culmination of the union of two indica landraces from South-Central Asia, namely the Hindu Kush, originating from the mountain range near the Afghanistan-Pakistan border, and a variant of Afghani, with its characteristic purple tinge. 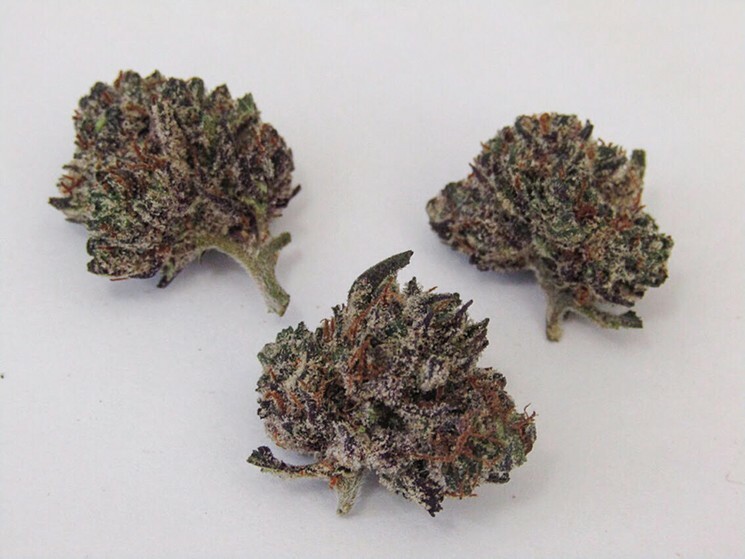 Due to its purely indica genes, and a THC composition ranging between 17 and 27 percent, the Purple Kush provides the smoker with a slow but relaxing full body high. In 2016, it was named as one of the top 10 Kush Strains by the magazine High Times magazine. 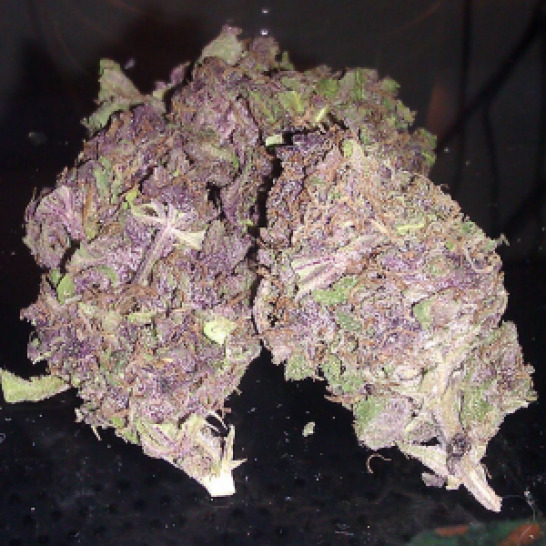 The Purple Kush has dense buds and small to medium flowers that are clustered together like popcorn. The flowers have orange pistils and are covered by white trichomes. The leaves can be either green or pink, depending upon each particular plant’s phenotype. The purple leaves appear if the plant is cultivated in colder conditions, as that activates the pigments, anthocyanins. Just like the Purple Kush’s parent strain, the Purple Afghani, this strain too can create a sticky resin which is used for producing hash and other similar concentrates. 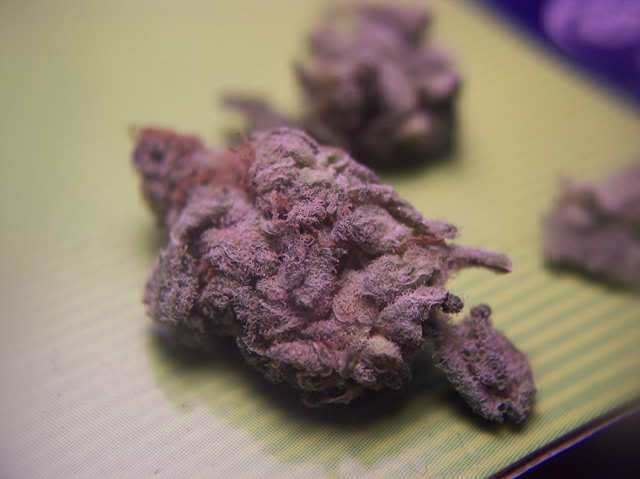 Purple Kush is not just pleasant to look at but is also a treat for the palate. Initially, the odor is earthy and musky, similar to other Afghani strains. Eventually, the fruity, sweet undernotes become more prominent. In particular, the Purple Kush has a grape-like smell. Upon combustion, the flowers emit both a hash-like and fruity smoke and smell. This can often lead to coughing and irritate the sinuses. Upon exhalation, the smoke from this strain has a sweet taste similar to that of grapes. Some people even compare this taste to that of a cough syrup or dessert wine. 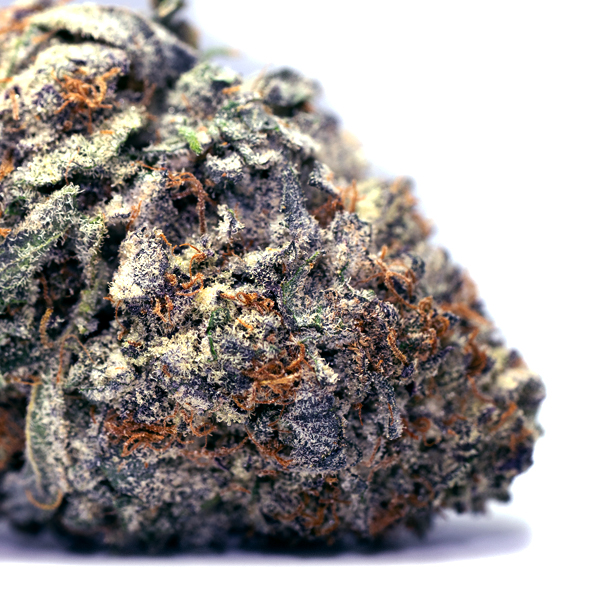 With the Purple Kush, you can expect to fall into a relaxed state straightaway. As it is a purely indica strain, its effects are mostly just physical, but there are a few mental effects too, such as lowered cerebral activity so that you are in a state of contentment. Smokers will experience a full body high and a feeling of heaviness to accompany a permanent smile while effects last. On average, the effects of Purple Kush last for 2 to 4 hours. Purple Kush has proven to be quite effective in medicine. 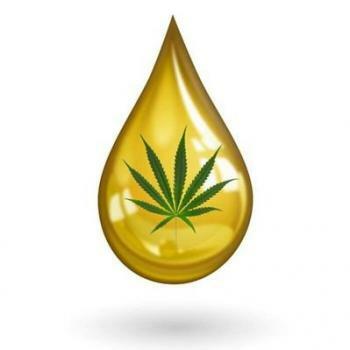 With its sedative effect, it can provide relief from symptoms of depression and anxiety. It can also be used as a pain reliever for both nerve related pains and body aches. It can also help insomnia patients sleep better. The plant of the Purple Kush is bushy and low in height. It can be grown both indoors and outdoors, however, the results are usually better if cultivated indoors as you can keep a better check on the growing conditions. The fact that the plant of this strain is small means that you can easily grow a large number of these plants in a limited space. By exposing the plants to cold temperatures, you can bring out the purple pigmentation. But make sure to only do so just before harvesting. Otherwise, the low temperatures could reduce the yield. Typically, it takes around 8 weeks for the Purple Kush to flower if grown indoors and gives a medium yield of around 37 grams per square foot of the crop. Of course, if you want to maintain the taste and color of the strain, it is important to cure the buds after harvesting. To do so, simply hang them upside down for a week or so in a room with a consistent humidity level of around 50% and temperature 70 degrees Fahrenheit. This will dry out the buds. After this, seal them in jars and store in a room with the same temperature and humidity between 60 to 65 percent. Purple Kush is one of those rare strains that maintain their bold flavors despite their visual appeal. Great from both outside and in. It has also given rise to quite a few variant strains such as the Las Vegas Purple Kush. Purple Kush can flower in as little as 6 weeks, much faster than many other marijuana strains. The Purple Kush strain is a smaller plant, and will grow on average, up to 30 inches tall. The Purple Kush strain offers an typical yield between 1 and 3 oz per square foot, on average. When smoked or converted into an edible form, the flavor of the Purple Kush strain is best described as Earthy, Grape, and Berry. Relaxed 99.32% of users reported feeling relaxed. Happiness 68.91% of users reported feeling happier. Lack of Appetite 39.95% indicated a decrease in appetite. Euphoria 50.43% of users reported feelings of happiness. Anti-Depressant 73.83% of users felt uplifted after consumption. Pain Reduction 84.4% of users noticed a reduction in pain. Insomnia 48.74% of users reported sleeping improvements. Stressed 99.55% of users reported reduced stress. Dry Mouth 99.57% of users reported a dry mouth. Dry Eyes 51.85% of users reported dry eyes. Insomnia 90.21% of users reported trouble sleeping. Dizziness 38.3% of users reported feeling dizziness. Headaches 19.91% of users reported headaches. Anxiety 18.11% of users reported feeling anxious. Sleepy 68.85% of users reported feeling sleepy. 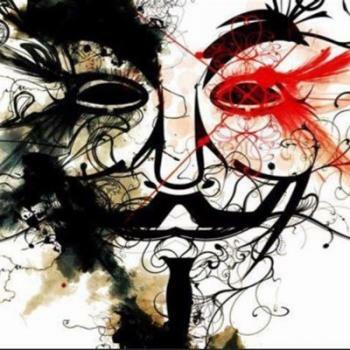 Below you can find a list of strains that are parents and predecessors which led to the medicinal effects and properties of the Purple Kush cannabis strain. It was through the breeding of these strains which led to the production of Purple Kush marijuana seeds, while attempting to cultivate their combined effects and therapeutic properties. Hindu Kush is a pure indica strain named right following the mountain len..
A potent plant that is easy to grow. 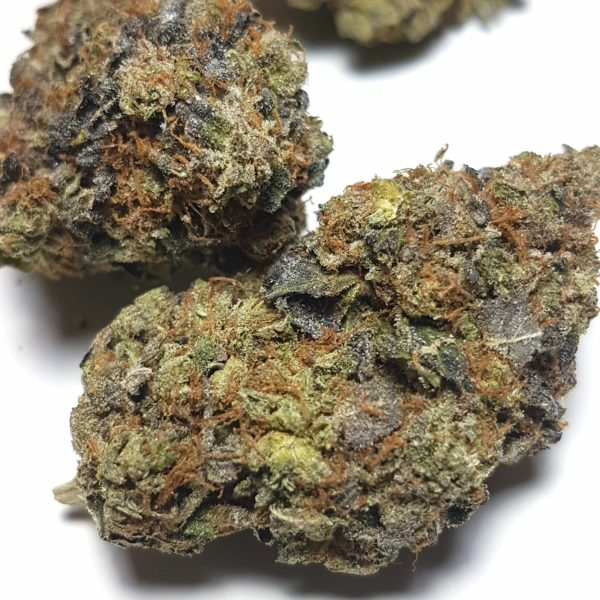 This Afghani is a mostly Indica inbr..
Below you can find a list of strains which were bred from Purple Kush in an attempt to leverge it's medicinal properties and growing attributes. New from breeders Alaska Built, Purple Aurora is a 60% indica, 35% sativa..
Purple Happy Rancher is a 75% indica spin-off of Purple Kush and Route 66..
Is Purple better grown inside or outside? How do I produce the best trichome count? Is this a good weekend strain? I haven't grown hydro yet. I'm wondering, since it's so popular, if Purple Kush is easy to grow hydro o.. I've heard some debates before on whether Purple is better when it's grown inside or out. Any suggestio.. I love weed with a good trichome count and know that purple kush is one of my favorites for this. Any g.. I've been looking for a more psychedelic strain to smoke on the weekend. I was wondering if Purple kush.. I haven't grown hydro yet. I'm wondering, since it's so popular, if Purple Kush is easy to grow hydro or if I should just stick to a soil medium? I've heard some debates before on whether Purple is better when it's grown inside or out. Any suggestions? 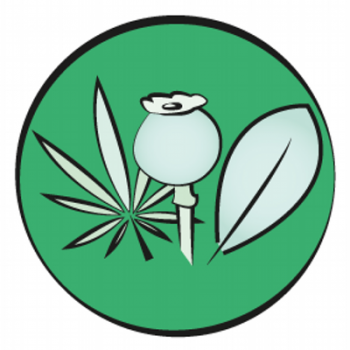 Take a look at the photos shared by the marijuana guide community, or share your own photo . A nice photo if i do say so myself, good smoke as most know! There are no comments on this picture yet! Legit, as perfect as can be. -Enjoy & Smoke on! i can't get enough of the purple in my life! (barney-grade purp) This stuff is all killer no filler.